Like an opiate, the euphoric effects of music are extremely addictive. Music addicts are genuine zealots with an incessant need to have, to hear, to keep up, and to experience the art form. The various styles and genres within music mimic the valleys and peaks of addiction. Listening to heartfelt music becomes a powerful habit. Eventually, we become dependant on music. How many times have you freaked out because your car because the radio did not work, a CD was scratched, a tape got eaten, or a new album was unattainable because the local record stores were sold out? The human heart beats to a rhythm. Do you honestly think that you do not need music? Like any other music junkie, Defari is an emcee who cannot live without rhythm. 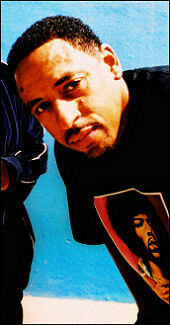 Hailing from Los Angeles, Defari first gained critical acclaim with the single, "Bionic" along with various collaborations with The Alkaholiks and Dilated Peoples. His debut album, "Focused Daily" was an underground gem with more than just a West coast vibe. Though he represented the West Coast, his style was more down-to-earth because his love of hip-hop ran deep within his veins. While heroin addicts put needles in their veins, Defari injects music into his soul via his ears. His heroin is a 12" vinyl record. His syringes are 2 turntables and a mixer. Classic collaborations gained him more fame. From his standout verse on "Some L.A. N*ggas" (from Dr. Dre's "2001" LP) to countless other collaborations, Defari always left a strong impression. His equally powerful live show also earned him a solid following. Released on High Times Records, his sophomore album, "Odds And Evens" faced obstacles due to problems within label. Some fans never even found a copy. With his business sense intact, he co-founded ABB Records. Artists like Little Brother and The Sound Providers helped to give ABB both respect and credibility. These groups are also addicted to the opiate of music. Meanwhile, Defari wrote songs over DJ Babu's production. The chemistry between Defari and DJ Babu (from Dilated Peoples and The Beat Junkies) was so special, they decided to form a group together, Likwit Junkies. One member from The Likwit Crew and one member from The Beat Junkies formed a whole new musical drug. Their debut album, "The L.J. 's" (released on ABB Records) is filled with soulful samples, varied emotional themes, and a deep love of music. While Babu produced and mixed the entire LP, Defari stood strong at the lyrical helm. The prodigious musicians stood their ground. Together, they follow the footsteps of hip-hop's legendary duos like Pete Rock & CL Smooth, Eric B. & Rakim, and Gangstarr (Guru & DJ Premier). As an emcee and songwriter, Defari has come full circle. While his solo albums have a West Coast sound with a gritty attitude, Defari's maturity shines on "The L.J. 's" LP. Maturity has not slowed him down. He can still have fun, move a crowd, and rock a microphone. On a sweltering Spring day in 2005, I spoke to the legendary emcee. Both of us are so addicted to music, we could not stop talking about the industry, recording, songwriting, live performances, etc. Our conversation was so in-depth, the tape actually ran out. We were just two music junkies on the phone, jonsing for a fix of rhythm. Defari: Sh*t, man, just chilling after a long day. MVRemix: You formed a new group with DJ Babu named The Likwit Junkies. The album is called 'The L.J.'s'. Tell us about both. Defari: Pretty much, it is myself and DJ Babu. Due to the success of the previous songs we did, we felt that we needed to collaborate and make an album or something. Now, we have a group. Here we are. MVRemix: Since DJ Babu produced the entire album, did you have a different approach to creating the LP, as opposed to other albums with different producers producing different songs? Defari: It's definitely different, because we had a group element going on. Production was Babu's job. My job was to write and hold down the vocals. Basically, we took the Gangstarr approach, with the influences of great superheroes like Gangstarr, Slick Rick and Dougie Fresh, Eric B and Rakim, and Pete Rock and CL Smooth. We basically took that aura and did our own thing. We used that same framework of the super duos of the past. MVRemix: Do you have a favorite song on 'The L.J. 's' LP? Defari: It changes all the time. 'Change' is one of my favorites, but I think 'Ghetto' is also one of my favorites. MVRemix: How is Babu different from the other producers you have worked with? Defari: He is a lot more soulful than most producers I have worked with. His background in soul music is very similar to mine. That's why we clicked. He has a real soul bone in his body. He can take any type of loop, that I may think of, and can make it a beat, in a heartbeat. Other producers may try to chop it up, rip it, and only do a certain part. Babs has no qualms about doing any idea that I have. At the same time, the beats like 'Keep Doin It' and 'One Day' are different. 9 out of 10 emcees can't ride those beats. Those beats prove very difficult for any other rapper. For me, it's nothing. I can kill any beat. MVRemix: When dealing with breath control, flow, or riding beats, how do you prepare or strategize? Defari: I have this new song I did with Fred Wreck on 'Street Music'. The style that I'm using on there is like, there is no breath. I can only describe it in melody. (Defari hums the melody) The style is like a waterfall. To perform live, it is very difficult. There is literally no breath in it. MVRemix: When recording a song, do you go into the studio with pre-written lyrics, or themes, or do you hear the beat first and then, write to the beat? Defari: I wrote most of the songs to the beat. I get the beat from the producer and ride with it. I just beat a block with it and punch in the lyrics into my Trio. That's pretty much how I do it. I go into the booth with my Trio. I used to go into the booth with my 2-Way, like 5 years ago. If the only thing I have available is the pen and pad, of course. I rarely use the pen and pad. MVRemix: You started out as a DJ. How did you make that transition from DJ to emcee? Defari: It was a natural metamorphosis. One record stood out at the time. 'Eric B. For President' inspired me to write my first rhyme. From there, I wrote and recorded a gang of songs before I ever came out with a bunch of songs professionally. It wasn't just an overnight thing. That's for sure. I recorded a whole bunch of songs through that whole black medallion era and the high-top fade era. I was writing, but I never felt I was ready, until I did 'Big Up' with E-Swift. When I did 'Bionic', I really felt I had an itch. MVRemix: You founded ABB Records? Defari: Yeah, I co-founded ABB. We dropped the 'Inaugural' single with 'Bionic'. We followed that up with 'Third Degree' by Dilated Peoples, featuring yours truly. MVRemix: Did you have anything to do with Little Brother signing to ABB Records? Defari: Nah, I didn't have anything to do with Little Brother. They came out on ABB. While I was doing my thing, touring, bouncing around on different labels, and being on the grind, I brought a lot of acts to Ben. Planet Asia, Krondon, and Dilated Peoples. It's a trip because the 'Work The Angels' single is probably the biggest independent hip-hop single ever. 'Bionic' is a close second. MVRemix: How did the whole connection between you, Dilated Peoples, and The Alkaholiks come together? Defari: I hooked up with Dilated on 'The Next Chapter'. We both had songs on the record. Coincidentally, I hooked up with E-Swift and did my first single, 'Big Up'. I've been down with Likwit ever since. That was 1995. From there, the tree just blossomed. OG's like Dr. Dre. The funny thing is, I was born and raised in L.A., and so are Rakka and Evidence from Dilated. Actually, only J-Ro from the Liks and myself are the only cats from the town. When I came back after touring, I met a whole new era of cats. When I was in high school, there was a whole different era of cats I knew in L.A. You feel me? A whole slew of cats came. The people I'm talking about now, in this interview, don't even know these new cats. It's a trip. MVRemix: Is everything still cool between Xzibit and The Liks? Defari: Yeah, old as Magic Johnson. Defari: Now, I have a new one. I have new songs. Now, it is about picking the songs I want to do. Defari: Probably, when I first touch the stage. When I'm on tour, I think my favorite part is when I leave. (laughs). You feel me? It depends how tired I am and what city I am in. But, really, wherever I'm at, that first part I touch stage with that first song, is my favorite part. One part I really loved was, when I used to sit down and do 'Keep It The Rise Part 2'. I would act like I'm driving. I would sit in a chair and act like I'm driving through the town. I would blow a blunt and do the song. It was a really cool change of pace. I don't do that song anymore, but it was dope. MVRemix: Do you open up with the same song all the time, or does the first song of your live show change? Defari: It changes. Now, I'm opening up with new songs, but I don't want to let the cat out of the bag. I open up with different songs. It depends. MVRemix: What are the signature songs you always perform? Defari: The people will always get 'Bionic'. Also, 'Smack Ya Face'. Those are signatures. I like to do 'Spell My Name', but I like to stay fresh and exciting. I like people to think that I hit them with different jams, but also the classics they know me for. 'Behold My Life'. There are so many songs, I can't do them all. One of my favorite parts is when I do the Dr. Dre song 'Some L.A. N*ggas'. I do my verse from there. It's a call and response from the crowd. No matter where I'm at, the crowd goes bananas.